Never eaten Dover sole? Here’s all you need to know. If you’ve never eaten Dover sole, you are missing one of the best treats in life. Here’s a little info about this majestic fish to whet your appetite. Dover sole is a right-eyed flatfish – it has its mouth on the left side, as do all true members of the sole family. Dover sole lives only in the sea waters stretching from the Mediterranean to the North Sea. If you’ve had Dover sole in America and were disappointed, it’s because they’ve sold you ‘West Coast’ or Pacific Dover sole – not a patch on the real thing. Dover sole is thick-bodied, but never larger than around 16 to 20 inches in length. So, why is Dover sole called Dover sole? Simply because of the quantity of this species that could be fished by the UK’s fishing fleet, and that the fleet fishing out of Dover supplied more to Billingsgate Fish Market than any other. The best Dover sole is said to be caught in the North Sea of the Bay of Biscay. Wolfgang Puck, one of the world’s most celebrated chefs, once famously said “I like Dover sole. It’s always one of my favourites. I like it when I’m in England. I eat it every day, almost. I think it’s probably one of my favourite fish.” High praise indeed, from a chef who is noted for his fish dishes. You’ll find that Dover sole is unlike other fish. It doesn’t have the texture of a normal fish. Its flesh is more like a meat, and it has a delicate, mild, and sweet flavour. 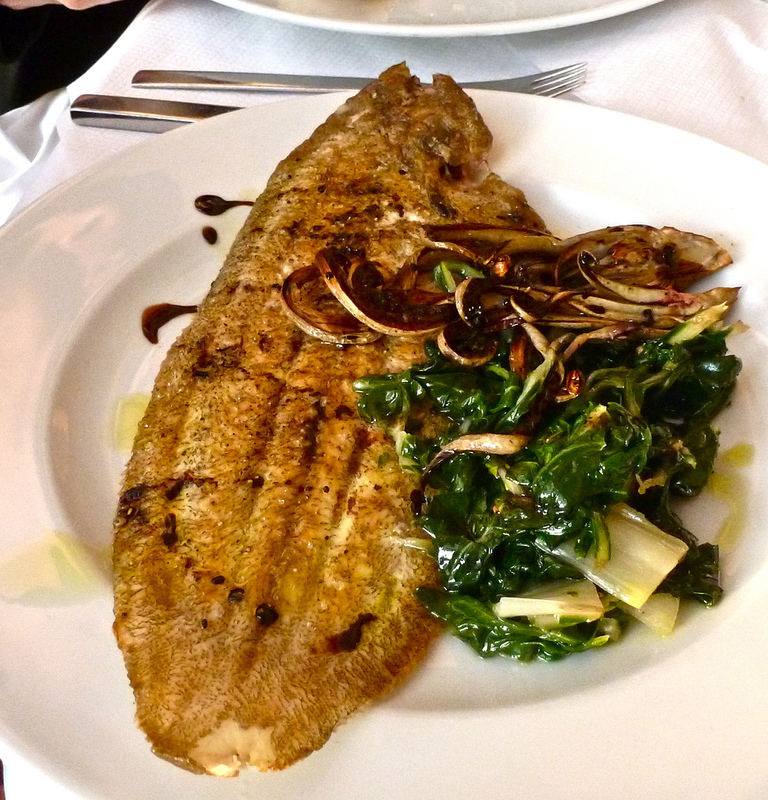 I know non-fish eaters who love Dover sole. What sauce is best with Dover sole? While it is easily accompanied by a heavy European sauce, such as a béarnaise, I prefer to pair it with a lemon parsley butter or homemade tartar sauce. This gives the dish just a little extra something without distracting from the incredible taste sensation that is Dover sole. How should you cook Dover sole? Dover sole is versatile to cook with. It can be baked, poached, steamed or gilled. Our dish is prepared by panfrying in a little butter. Whichever method used, it is important to treat Dover sole with the respect it deserves, and never to overcook. It should flake easily, remain succulent, and present well on the fork. If you are preparing Dover sole at home, don’t waste the bones. They are harder than the bones of many other fish such as salmon and trout, and not as oily; ideal to make a quality fish stock. What wine should you pair with Dover sole? Deciding what wine you should pair with fish can be difficult. With Dover sole, you mustn’t mask the flavour with the wine. So, we would recommend that you select a Chablis, Chardonnay, or Sauvignon Blanc – a dry, delicate, and neutral white. For a delightful and delicious Dover sole, book your table at Christopher’s. Call us on (+34) 600 01 28 24.